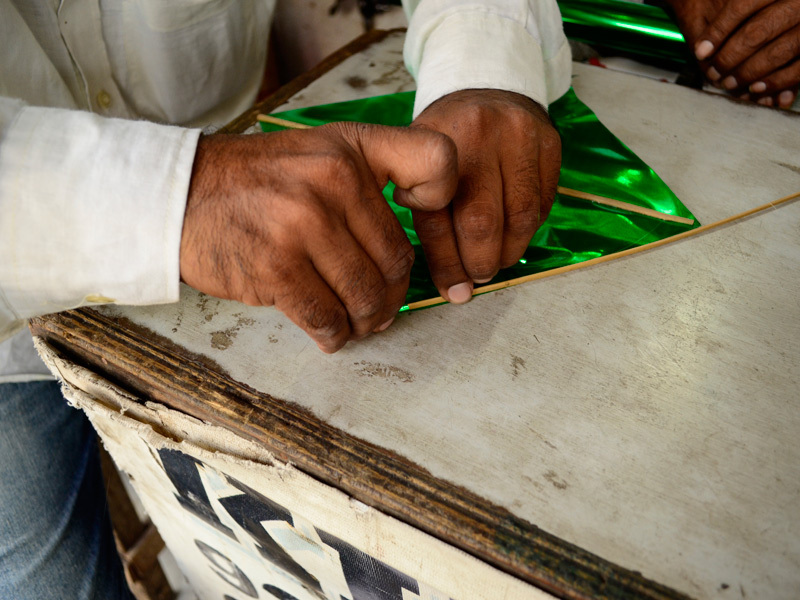 The basic material - roll of foil paper being folded to the required size. Scissors are used to cut the paper. The folded triangular paper, opened up looks like a rhombus, with extra material at two opposite ends. A bamboo stick is placed like a diagonal and the size is checked. This is bent into a smooth semicircle, placed as shown like the other diagonal in the rhombus. The ends of this semi circular stick are stuck to the rhombus shaped paper as seen. This long strip is rolled as can be seen here. 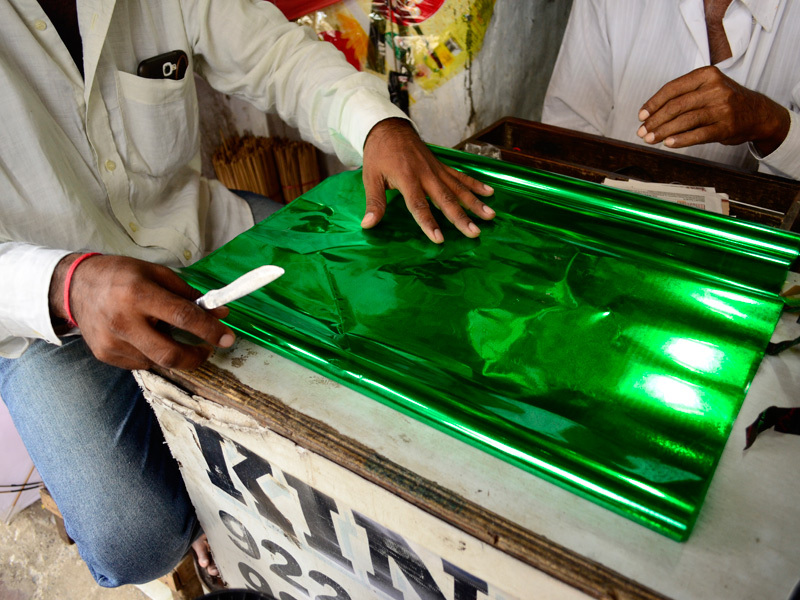 The rolled paper is flattened using the blunt edge of the knife as can be seen. 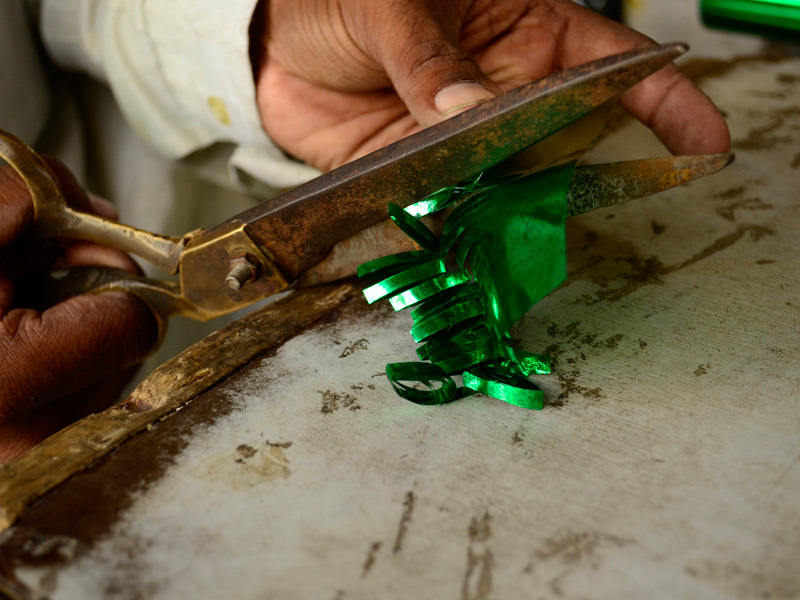 Scissors are used to make vertical, parallel cuts as can be seen. 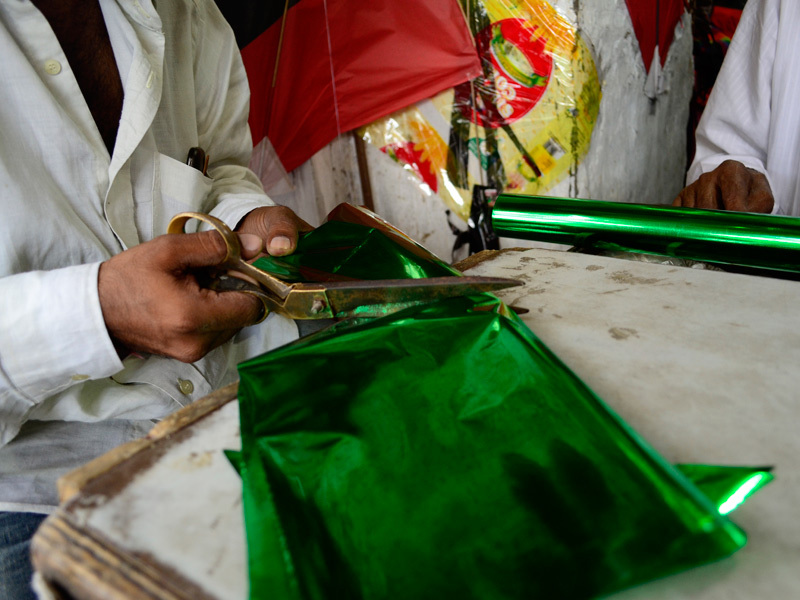 Once the cutting is complete, the rolled paper is opened up to resemble a long fringe. 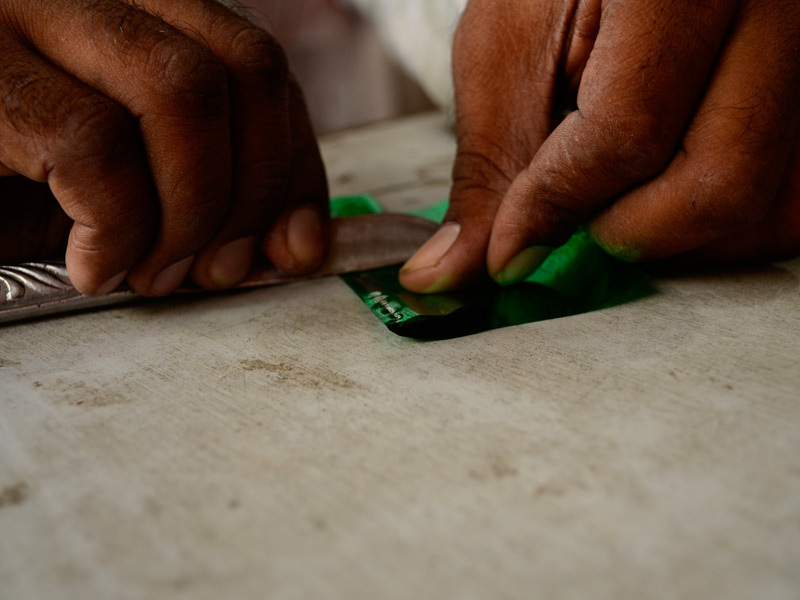 Glue is applied to the top part of the fringe. The finished foil paper kite. Kite flying is a popular hobby and an exciting sport in India. 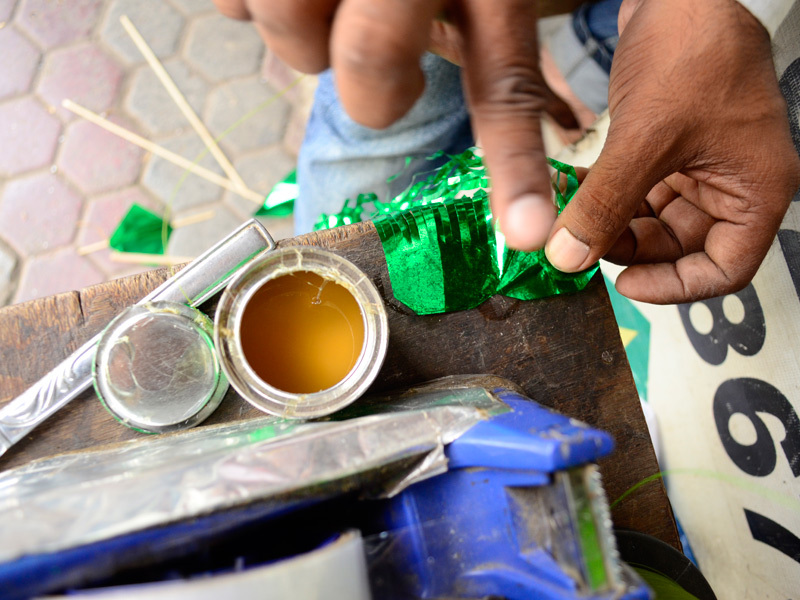 The peak season for flying kites in India is during festivals of Makara Sankranthi and Basant Panchami. 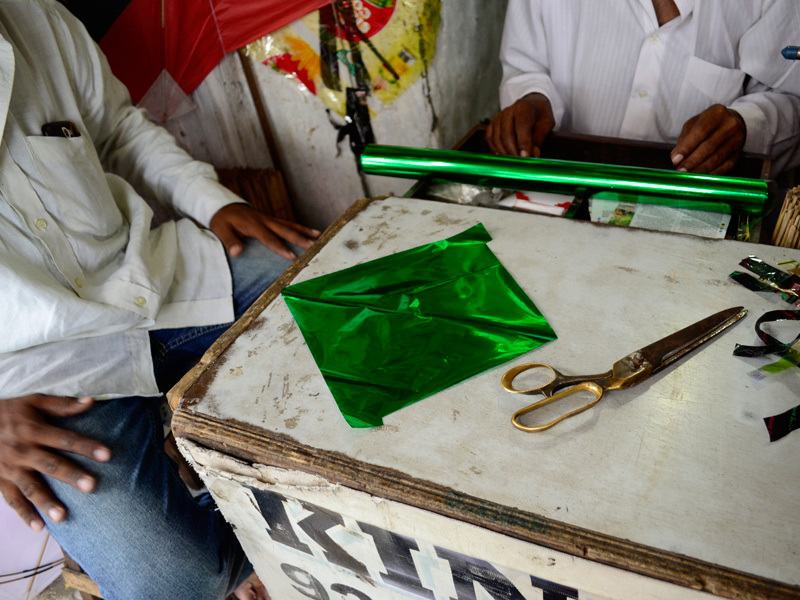 From the early times when kite flying began in India, the art of kite making has been transferred from one generation to the next. 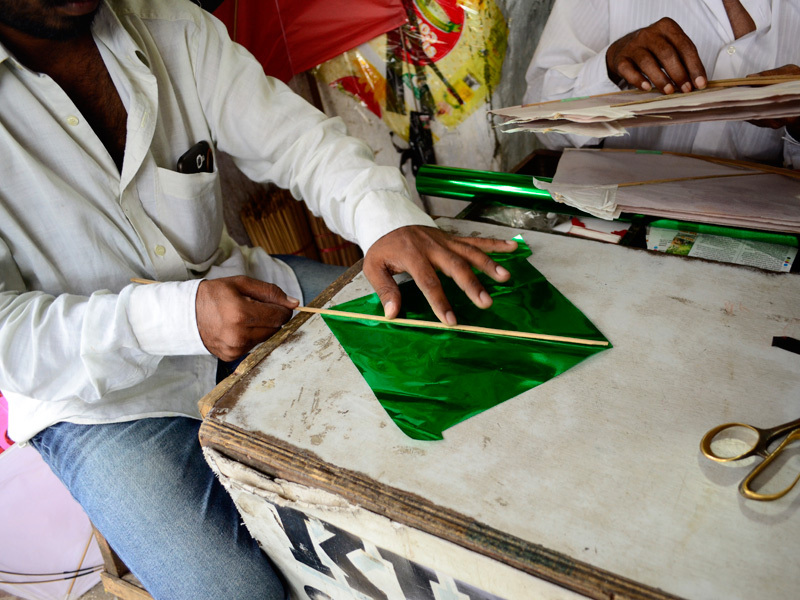 The kite making process is quite simple, and over the years many kite variations have been created. 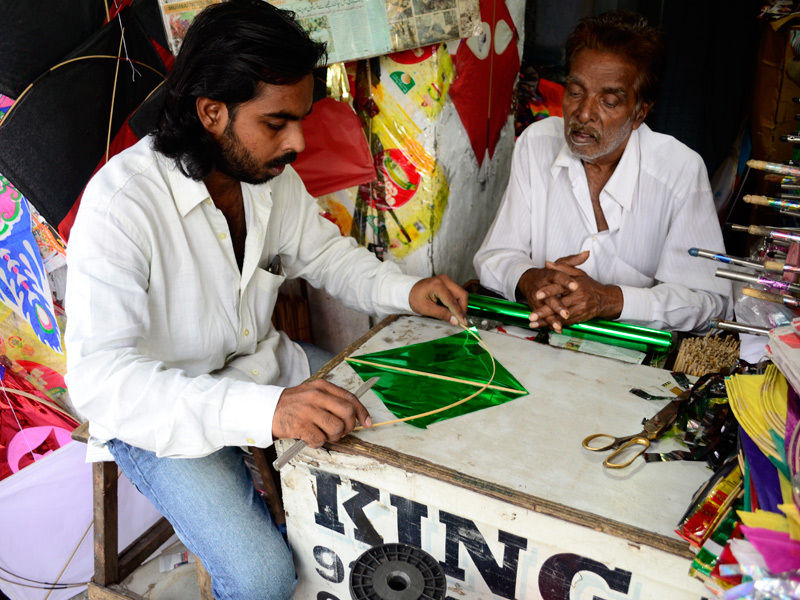 To earn a living by being a kite maker, making a large number of kites and different kind of kites in a day requires a lot of expertise. 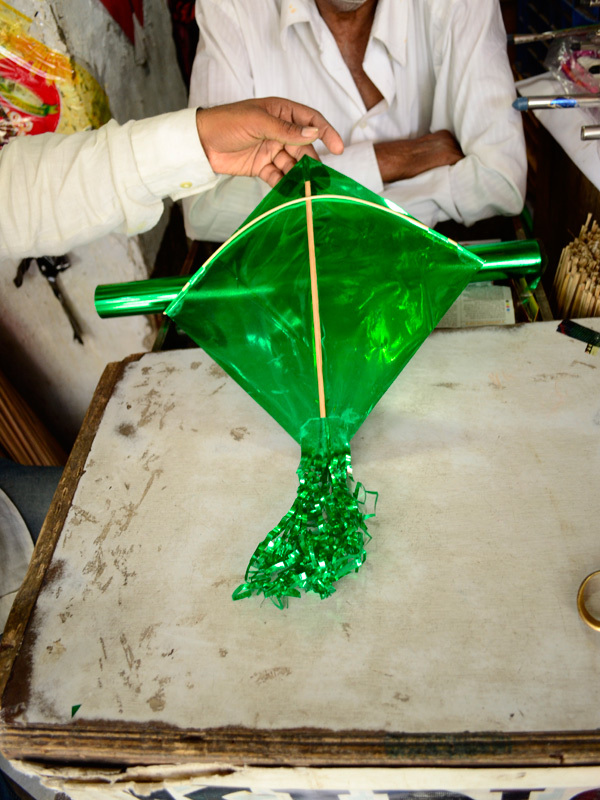 Though, hobbyists can make basic types of kites. 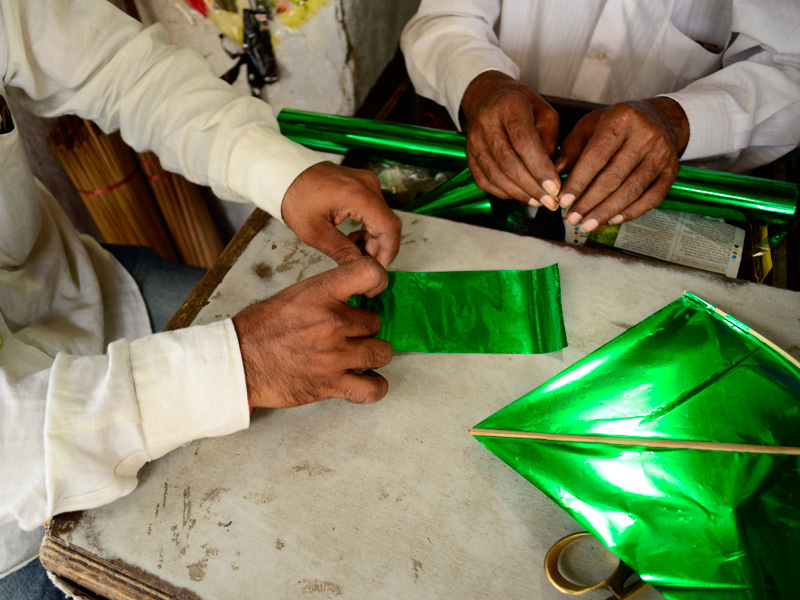 The kite’s craftsmanship is of utmost importance. 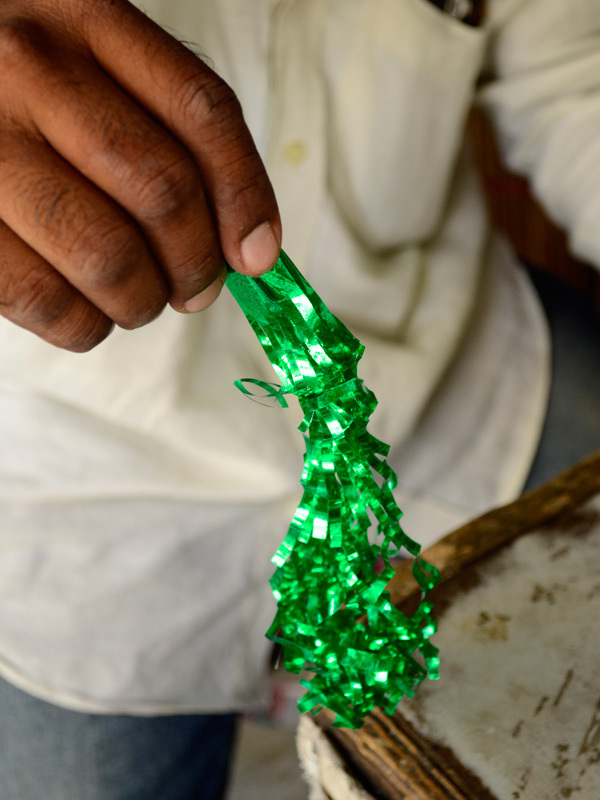 This simple little paper and bamboo object though mass-produced, is made by hand- a product of the keen eyes and talented fingers of an expert.